After a brief setback flying in Australia, Slovene pilot/photographer/author/biologist Matevz Lenarcic who is flying around the world in his modified Pipistrel Virus SW 914 Turbo is back in the air and recently flew above the Himalayas for a bird’s eye view of Mt. Everest. According to AVweb, Lenarcic flew 29,344 feet or 8,944 meters above the Himalayas and roughly 300 feet above but not directly over Mt. Everest. Apparently, flying directly above or near Mt. Everest is difficult due to the need to obtain Nepali government permits to do so. Lenarcic got the permits but they were cancelled right before his flight. Nevertheless, he did the flight anyway but the news was only released when he was safely in India to avoid any trouble with Nepali bureaucrats. Flight into Everest region is still a bit uncertain due to restrictions and still high winds or bad weather. If it is clear they are high winds and severe turbulence which can easily destroy aircraft, in more calm days the clouds with snow could come over the Himalaya. Nevertheless, the flight ultimately went smoothly with beautiful weather and only minus 27 degrees Celsius temperatures with north westerly winds of 40 knots along with occasional turbulence. To follow Matevz Lenarcic’s around the world flight, check out his GreenLight World Flight website for the latest updates and plenty of great pictures. John Fiscus has written on the Cirrus Owners & Pilots Association (COPA) blog about an interesting observation he made while organizing his charts: The approach chart into Innsbruck Austria actually folds out and its one steep approach into the airport! Its worth noting that the approach into the Innsbruck Airport is actually a popular flight simulation and as you can see from the above video, most pilots (and passengers alike) would probably prefer doing the approach usig simulator software and not in real life! If you plan on doing any flying in a high altitude mountainous areas, Bill Schroeder, a Certified Flight Instructor who has been flying in the Lake Tahoe/Sierra Nevada Mountain region for more than 25 years, has written a very lengthy and must read article for General Aviation News about how to escape from a downdraft. Bill began by relating a hypothetical downdraft situation in the Sierra Nevada mountains that unfortunately is an all to common occurrence – especially for pilots not accustomed to high altitude mountain flying. Bill then wrote about some tried and true methods for heading into the wind while flying over ridges or a series of ridges. For starters, Bill noted that when a pilot is within a quarter to a half mile from the ridge, he or she should always approach the ridge at a 45° angle. He noted that it is dangerous to fly directly towards a ridge’s lee side when the wind exceeds 10 knots and you are slightly above, level or below the ridgeline. Bill also pointed out that a steady wind of 10 knots that is being funneled through a mountain pass or any uneven surface can greatly increase in speed and this phenomena is known as the “venturi effect.” In fact, wind speeds may actually double and or even in a mountainous environment. Bill then described in detail how to safely fly over a mountain ridge and then he noted that downdrafts come in different forms. For example: Some downdraft are smooth and you may not even realize that you are caught up in one unless you are keeping a close eye on the vertical speed indicator. Hence, you should always watch your vertical speed indicator while flying in mountainous areas. On the other hand, some downdrafts may cause a sudden and severe jolt that is then followed by a lull and more jolts – which can come from all directions. This could make your aircraft difficult to control. However, its also important to not over-control the aircraft and accept altitude loss while attempting to fly at a safe altitude. At the end of the article, Bill pointed out that most downdraft related accidents are caused by a pilot’s concern about altitude loss instead of trying to escape from the ridge that is actually causing the downdraft and altitude loss in the first place. 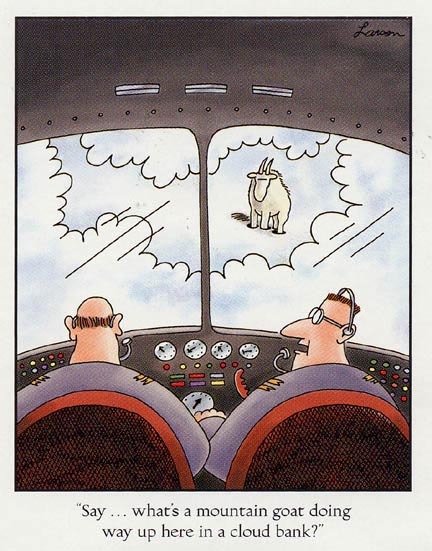 Hence, Bill’s entire lengthy article about downdrafts is a must read if you intend to do any high altitude flying over mountains. Once the woman got the autopilot turned on, the aircraft began a controlled descent and eventually the pilot became more lucid. The pilot would later safely land in Farmington, New Mexico. Apparently, the 70-year-old pilot had been communicating with ATC when he appeared to begin have difficulty breathing. His wife would later report that he was slurring his speech and that he was unable to push any of the buttons. The aircraft began to make erratic maneuvers while the Great Lakes Pilot, who was on the same radio frequency, lent his assistance as ATC struggled to get in touch with the pilot. Certainly there are lessons here if you plan on flying at high altitudes or over mountains to be prepared and to have your passengers prepared just in case you suffer from hypoxia. In this case, the woman had the instructions for pulling the parachute on her lap – as a last minute resort.